Coding is gradually making its way from club to curriculum, thanks largely to the nationwide science, technology, engineering and mathematics (STEM) phenomenon embraced by so many American schools. Districts with multiple makerspaces describe what works. On the heels of Betsy DeVos' confirmation as the new head of the United States Department of Education, several Republican representatives have introduced a bill to eliminate the department altogether. Personalized learning presents the opportunity to shift education by tailoring the learning experience to an individual student's needs and interests while helping them gain the knowledge, skills and experiences they need to succeed in college and career. Just hours after Betsy DeVos was officially confirmed as education secretary by the United States Senate, a Republican-led Congress dismantled rules laying out how parts of the Every Student Succeeds Act (ESSA) and the Higher Education Act (HEA) would be implemented. On Monday, Senate and House Joint Resolution 57 and H.J. 58 were passed along for a vote to the full House by the House Rules Committee. A recent study found that middle schools where students reported a "more positive" school climate had higher academic performance, and that changes in the school climate also correlated with changes in academic performance. The annual Digital Learning Day, started in 2012, gives educators an opportunity to collaborate with peers, share ideas, try out new digital tools, celebrate education innovation and play a role in the transformation of their own schools and communities. Digital Learning Day 2017 is Thursday, Feb. 23. FCC regulators are telling nine companies that they won’t be allowed to participate in a federal program intended to help them provide affordable internet access to low-income consumers — weeks after those companies were approved to do so. Great things can come from humble beginnings. At Isenberg Elementary School in Salisbury, NC, Anthony Johnson, a former high school dropout turned teacher of the year, has transformed his science and social studies classrooms. He turned his classroom into “Johnsonville,” a fictional world where each student must find a job, pay the bills, pay mortgage and taxes, and learn by doing projects. With tens of thousands of school employees affected, IRS officials are telling schools that this cyberattack is one of the most dangerous phishing scams the federal organization has ever seen. THE Journal Insider offers readers the best our magazine has to offer. Each issue contains select articles chosen by the editors for their appeal to readers and for their significance in advancing the mission of education technology in K-12. THE Journal Insider is published monthly. Are you enjoying the online newsletters, but missing the magazine? 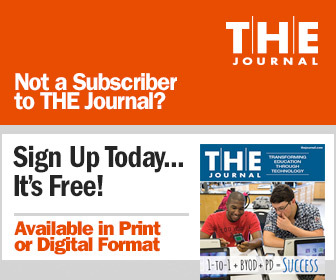 Sign up for a free subscription to THE Journal and receive news, opinions, and feature articles about technology in K-12 education. To see complete details and to subscribe online, click here.